Parmesan and Romano—blended with the creamy goodness of Land O Lakes® Deli American Cheese. Add this delicious cheese to everything from favorite dishes to lunchbox sandwiches or burgers hot off the grill. The creamy, decadent taste truly makes each dish an everyday masterpiece. The Land O’Lakes Test Kitchens have developed recipes and tips that highlight the wide range of uses for this cheese. Find recipes, photos and tips on the Taste of Italy product inspiration page at http://www.landolakes.com/4CheeseItalianBlend. Did you know April is National Grilled Cheese Month? And who doesn't love grilled cheese? 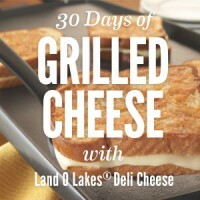 To celebrate this, Kitchen Play and Land O' Lakes have teamed up for "30 Days of Grilled Cheese" ... Yum. There is currently a gallery at Kitchen Play that lists the 30 bloggers and their grilled cheese creations - one post for each day. What a delicious month! Click the image below to see the other recipes. My personal favorite grilled cheese is a nutty Swiss paired with deli ham on rye. Simple, but so tasty. For this event, though I decided to do a riff on the famous Chicago Italian Beef sandwich. I sandwiched deli sliced Italian beef between slices of Land O' Lakes 4 Cheese Italian Blend deli cheese and topped it with a classic giardiniera on garlic buttered Italian bread. It was near perfection. My oldest daughter and I shopped for the ingredients for this delicious grilled cheese and once we got everything home and tasted the cheese we were too excited to have these. The 4 Cheese Italian Blend is my new favorite cheese. It's tangy, sharp and creamy all in one and was the perfect complement to the strong flavors of the Italian beef, giardiniera and garlic bread. From April 1 through May 1, Land O’Lakes will donate $1 to Feeding America every time someone pins or repins a Land O’Lakes recipe on Pinterest. That’s eight meals for a hungry family when you pin a recipe—and eight more every time anyone else repins it. Giving goes viral. Find your favorite Grilled Cheese recipe to pin on landolakes.com. You all know I love that last part, so please follow the link and PIN your favorites to help feed others! Now, if you've ever had a real Chicago Italian Beef sandwich you know there's no cheese involved and there should be a good amount of au jus, but as a grilled cheese I felt the jus could stay home and the beef and cheese would pair well with the giardiniera and I was right. Give this one a try! 1. Squeeze roasted garlic from skins and blend well with butter until spreadable. 2. Spread one side of each slice of bread with garlic butter. 3. Lay bread on a grill pan or other heavy bottomed pan over medium-high heat. 4. Add one slice of cheese to each slice of bread in pan. 5. Layer on beef, giardiniera and other slice of cheese. Top with remaining slices of bread. 6. Cook until bottom side is golden brown and carefully flip to other side. 7. Cook until other side is golden brown and cheese is melted. Be careful not to let your grilled cheese burn! Disclosure: This post was sponsored by Land O’Lakes as part of the Kitchen Play Sidecar series. As always, all opinions given are my own.